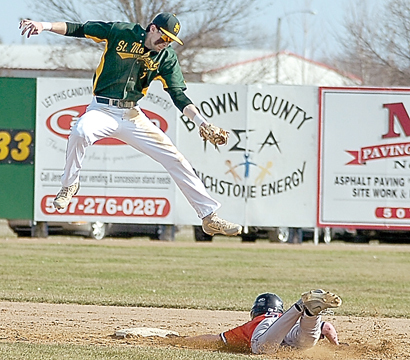 ESSIG — The New Ulm Brewers erased a 3-2 Essig lead in the sixth with three runs and added two more runs in the seventh as they eliminated Essig from the Tomahawk East League playoffs with a 9-3 win. New Ulm defeated Essig 5-0 in the first game. Mitch Kelly got the series-clinching win for the Brewers. 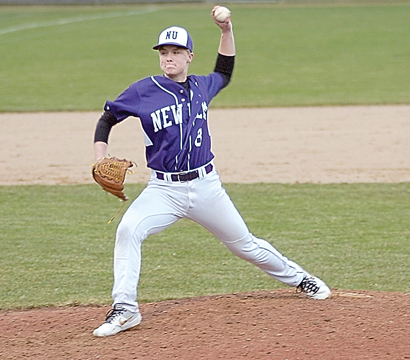 He went seven innings and allowed three runs on seven hits while striking out six. Jay Haala was tagged with the loss in relief of starter Avery Stevens. Haala gave up five runs in his 2 1/3 innings of work. Judd Davis and Hunter Ranweiler each had four hits for the Brewers with Hunter Ranweiler driving in two runs. Sam Berg and Zach More each added two hits. Erich Prokesch and Mitch Stueber each had two hits for the Bluejays. The Brewers now advance to Region 2C round-robin play beginning on Saturday when they face Hanska. Time and site have yet to be announced. New Ulm grabbed a 1-0 lead early when Davis tripled to deep center to start the game. He trotted home on Hunter Ranweiler’s single. But the Bluejays countered with single runs in the first and second innings off of the right-handed Kelly. In the first it was a walk to Kyle Helget, and an Erich Prokosch single and a double steal. Essig added another run in the second for a 2-1 lead when Hunter Sehr and Ben Wolf singled before a Helget base hit plated Sehr. Each team added a run in the third with the Brewers scoring when Davis singled, stole second and came home on Hunter Ranweiler’s base hit. The Bluejays matched that with a run in the bottom of the inning on a Stueber single, a stolen base, an error and an Alex Guggisberg suicide squeeze bunt. 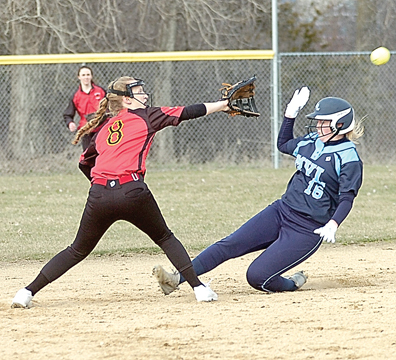 But in the sixth, New Ulm erupted for three runs to take momentum in the game, scoring all of their runs after two were out. Hunter Ranweiler singled and stole second. After two were out, Sam Berg delivered a clutch RBI single. Berg rambled home on a Jason Shaul double. A More RBI single made it a 5-3 Brewers lead. The Brewers added two more runs in the seventh on infield singles from Hunter Ranweiler and Wade French, an error and a Brady Ranweiler groundout. Berg’s RBI double in the eighth made it 9-3.